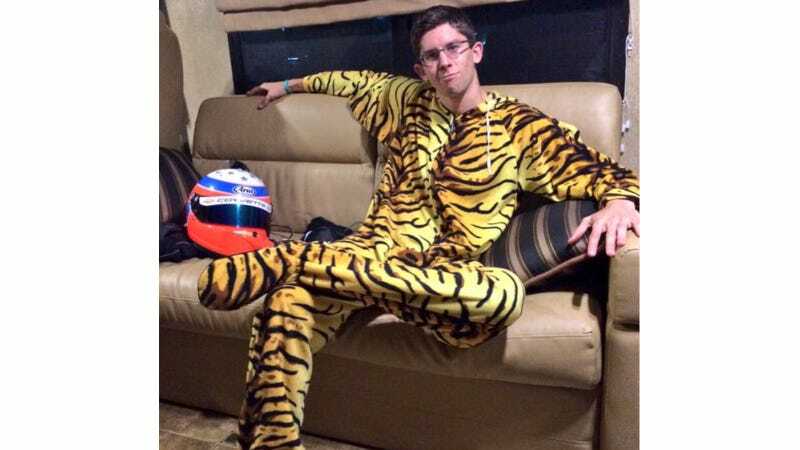 While part of me is a little disappointed that folks are just going back to their RVs to nap like normal, boring human beings instead of passing out at random spots in the paddock, I can't be disappointed in these pajamas. Are your pajamas this cool? The motorsports nap game just got pwn'd. I repeat: Tiger. Print. Onesie. This guy was also leading the Rolex 24 in the #10 Wayne Taylor Racing Corvette Daytona Prototype for the longest time, so I'm pretty sure he could pass out in a tutu at this point and get away with it. The #10 is currently in second place, with Max Angelelli at the wheel.